His story will be told in a new documentary narrated by Martin Sheen, ‘Guns and Rosaries’, which claims that the South American leg of his ‘Recite the Rosary’ crusade in the 1950s was funded by the Central Intelligence Agency. Peyton, who emigrated to the US at the age of 19, contracted tuberculosis while studying for the priesthood in the 1930s, but made a full, unexpected recovery after turning to prayer on his sickbed. 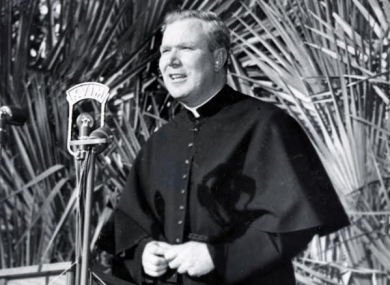 After being ordained in 1941, he began the Family Rosary Crusade, a movement which aimed to get 10 million families to commit to praying the Rosary. Peyton built up a huge following during the 1940s after popularising the slogan “the family that prays together stays together”, and grew his presence on radio, TV and in Hollywood. His growing influence soon inspired him to bring the Family Rosary Crusade on the road, and he created an international stadium tour that attracted millions of people across the world. His efforts eventually came to the attention of the CIA, which the documentary claims secretly funded his crusade as a weapon of devotion to fight Communism during the Cold War. “The Rosary is the offensive weapon that will destroy Communism — the great evil that seeks to destroy the faith,” Peyton once said in a radio broadcast, conscious of the political nature of his crusade. In 1959, the CIA started to secretly fund Fr Peyton’s Crusade, paying for advertising, promotion and events, with Brazil a particular focus of the strategy. “I consider the Crusades in Latin America throughout the decade of the sixties as the most significant and the most effective,” Peyton said. However, his superiors were not pleased by the secret funding, and the matter was brought to the attention of the Vatican before Pope Paul VI ordered Peyton to stop. As time went on, Peyton’s message became less powerful, and his influence declined before his death in 1992 at the age of 83, but in 2017, Pope Francis moved him closer to sainthood by naming him as ‘Venerable’. Among those to pay tribute to him in the documentary are former MEP Dana Rosemary Scallon, actor Bob Newhard, and author James O’Toole. Newhart, one of the last Hollywood actors to work with Peyton, succinctly summed up the Mayo-born priest’s character. Email “'The Rosary is a weapon': New documentary reveals how a CIA-funded Irish priest fought Communism”. Feedback on “'The Rosary is a weapon': New documentary reveals how a CIA-funded Irish priest fought Communism”.